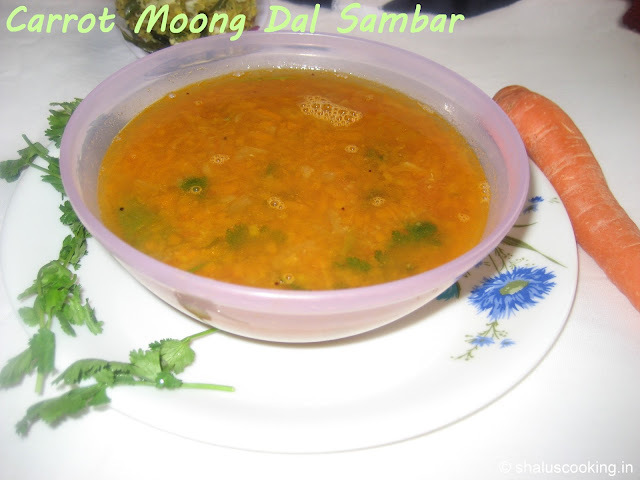 Hello Friends, its been long since I posted here... We had guests at home for few days then we went for a holiday trip and after that I was little lazy to post and the days went on like that ;) So after a long time, I am posting Carrot Moong Dal Sambar today. This is a very simple sambar to prepare which can be used as side dish for tiffin items. This sambar will not taste that good with rice, atleast I don't prefer it with rice. But will taste wonderful with idli, dosa, uttapam etc. Moong Dal - 50 gm. Shallot - 4 to 5 No. Sambar Powder - 1/2` tsp. 1. 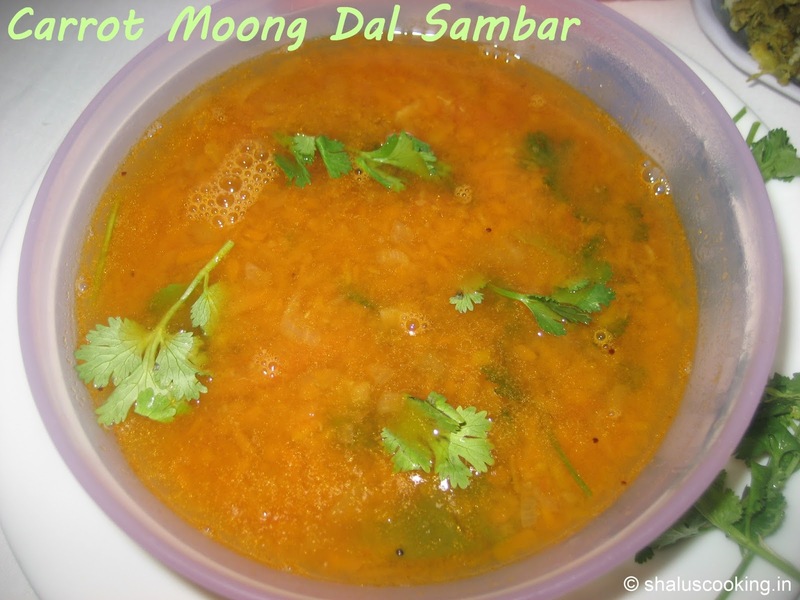 Keep all the ingredients ready to make Carrot Moong Dal Sambar. b. Peel and chop the shallots. 2. Take a pressure cooker and add moong dal, grated carrot, shallots, tomato, green chilli, cumin seeds and asafoetida. Add enough water and pressure cook it for 4 to 5 whistles. Once the pressure is released, open the lid and mash the dal nicely using a ladle or a masher. 3. Place the cooker with dal on flame, add sambar powder and salt. Add water and mix it well. Allow this mixture to boil. 4. While it is boiling, let us prepare the tempering. Heat oil in a tadka pan, add mustard seeds. When the mustard seeds splutter, add the onion and curry leaves. Saute till the onion turns light brown color. 5. Add the tempering to the boiling sambar. Give it a nice mix. 6. Let the sambar boil till the raw smell of sambar powder goes off. Add chopped coriander leaves and switch off the flame. Easy Carrot Moong Dal Sambar is ready to serve. Serve this sambar with idli, dosa, uttapam etc.